5ml Bottle of High Altitude, Lavender Essential Oil with Information Card. Ingredients: 100% Pure Lavandula Angustifolia (Lavender) Essential Oil. Bulk Discount: Buy 2 - 4 and receive $.50 off per bottle; 5 or more receive $1.50 off each bottle. 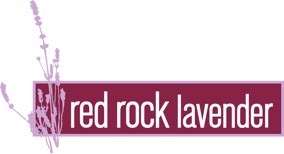 Red Rock Lavender's Lavender Essential Oil is bottled in dark violetglass. A high quality glass bottle that offers optimal protection to the essential oil against the harmful effects of light. It increases the shelf life and prolongs its potency. It is capped with a glass drop dispenser. Lavender is the single most useful essential oil. Lavender has a calming and soothing effect. It is added to Red Rock Lavender's spray mists, lotion, shea butter cream, shower gel, and candles. Common Applications: Aromatic lamp, air-freshener, bath, massage and more. Recommendation: Dilute the lavender essential oil before applying on the skin directly. I use this nightly for leg cramps by rubbing on the soles of my feet. This is the BEST smelling lavender! Your lavender oil is great; both my husband and I use it. However, your little bottles are too small. It would be preferable if you would offer it for purchase in a larger container (without the stopper) - something with just a screw on lid. The product is great, the size of the bottle is not. Need to have a larger size as 0.5mL is way too small to be of any good use. I ordered six and would prefer something 4x the current size. This is only my second year to purchase lavender oil from Red Rock Lavender Farm, but I enjoyed it so much last year I decided to purchase it again. I make my own lavender spray and fabric softener and will be trying my hand at some other homemade process such as body wash. I like the quality of this oil over the commercial brands purchased in the store. Only wish I could have made the trip this year. Next year for sure. I've had my little bottle I received as a gift some years ago, and just now reordered. Using it sparingly, I savored every drop! The aromas are pure and the texture of the oil is perfect. I'm happy to double my own stock now, have referred friends to the site and to check out the annual festival in June. Thank you! This lavender essential oil is one of the best I have found. It is a great price and my last bottle lasted over 12 months. We toured this farm a couple of years ago and fell in love with their products. I make my own moisturizer and this is definitelty a key ingredient. It's been a staple of mine for some time now and a present that my friends love to receive. This is an exquisite product. Round, full fragrance. Great for insect bites. I have purchased this product and many others at the farm and online for years! Never disappointed! Click the button below to add the Lavender Essential Oil to your wish list.